If you are intent on shedding those couple of unwanted additional pounds that crept on over the festive season or if you’re planning on losing a few as part of your New Year’s resolution, then it is important to have the right set of bathroom scales to help monitor your progress. There are all manner of mechanical or digital scales which range from basic to high-tech. Mechanical scales are what you might consider the traditional type of scale, requiring no electronic technology but instead relying on the principle of physics known as Hooke’s Law, which states that the stretch of a spring is directly proportional to the applied force. Inside the scales there are 4 brackets which distribute the weight of the user evenly to 4 levers, which are attached to a plate which in turn is attached to a spring. The spring will only support a certain amount of weight and so the weight that is applied to the spring determines a ratio which measures relative difference. The spring moves up and down according to this ratio, moving a rack and pinion which controls the dial that will display the correct weight of the user. The Salter Speedo mechanical scale has a large standing surface and an easy to read dial display which reads in both kilograms and stone. The Salter Stow-A-Weigh Compact mechanical scale has a smaller platform and comes with its own stand for conveniently storing the scales on when not in use. The Stow-A-Weigh range from Salter also features a digital scale and an analyser scale. The Salter Stow-A-Weigh electronic bathroom scales have an easy-to-read LED display which will show kilograms or stone. These scales are operated by a simple step on, step off method which activates the scale and will the accurately weigh the user. The Salter Stow-A-Weigh analyser scales use the same activation method and also feature a clear LED display which will display weight along with body fat percentage, body water percentage, muscle mass and Body Mass Index. Digital scales utilise the same principles as mechanical scales however they interpret the information received in a different way, converting the force of the user’s weight into an electronic signal using a load cell sensor. An analog-to-digital converter translates changes in electrical resistance to calculate the weight. Salter Ultra Slim electronic scales are a modern, minimalistic addition to the bathroom, offering accuracy, reliability and simplicity for personal weighing. These scales feature a large platform to accommodate all users and they are available in green, black or black with stainless steel. The Salter Glass electronic bathroom scales have a contemporary design with a large clear glass platform which sits on stylish frame with a matt silver finish. 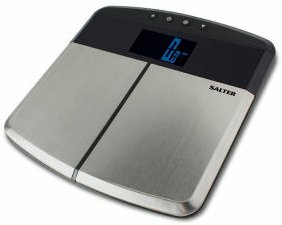 The Salter Stainless Steel Analyser bathroom scales do a lot more than display the weight of the user, it can measure body fat percentage, body water percentage, muscle mass, Body Mass Index and Basal Metabolic Rate (BMR is the number of calories the body uses while resting) and it can store this information for up to 12 users. This scale also benefits from child or athlete modes which adjust the scale intelligently to account for more or less muscle when measuring body fat. The Brabantia Body Analysis scales measure weight, body fat, water percentage, muscle percentage and BMI, which can be stored in the scales’ memory using your own Personal Number (up to 8 users) along with your age, gender, height and exercise regime to monitor your personal fitness. Brabantia’s other electronic bathrooms scales include XXL capacitiy, solar-powered and multi-functional options. The Brabantia Solar Powered scales do not need batteries and are therefore better for the environment. The Brabantia Digital bathroom scales with wall clock benefit from a large platform, power-saving automatic on / off and a large backlit display which can also be used as a digital clock display and hung on the wall bracket which is included. When weighing yourself, it is important to consider several factors which can influence the reading your scales will give. Weighing yourself two or three times a week is far better than weighing yourself daily because your body weight will naturally fluctuate on a day-to-day basis due to fluid intake and other variables. It is a good idea to weigh yourself at the same time of day, early in the morning after you’ve made your first visit to the bathroom is a good time. The surface you place your scales on should be even and hard – using the scale on a carpeted area can cause the scales to read incorrectly by up to 20%! Also, it is important to check your scales are accurate, maybe place a new bag of sugar on the scale just to make sure it is weighing exactly as it should be. Instead of using individual weigh-in results to track your progress, record your results over the course of each week and take an average of these results which will allow you to track your progress in a much more reasonably and reliably. Bathroom Scales, Brabantia, Digital Scales, Mechanical Scales, Personal Scales, Salter, Stow-A-Weigh, Weighing Scales. Bookmark.